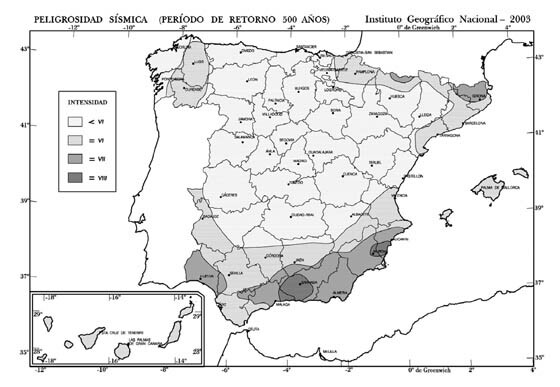 The history of Spain (excluding the 130-year period immediately preceding modernity) in the last seven centuries is replete with examples of destructive earthquakes with intensities above VIII on the Mercalli scale (above 5-6 on the Richter scale). "Earth tremors" and what to do if they occur, were subjects of study in schools and universities until a hundred years ago. The culture of the seismicity is a phenomenon that has not been updated as other aspects of the country have been, simply forgotten. SPAIN, VULNERABLE AS ITALY IS? When I published my article, "A Seismic Amnesia", in ABC and other journals, I received several comments from colleagues and friends, among them geologists, architects, engineers, professionals from the world of communication, and more. Most encourage me (despite precisely such amnesia and the increasingly scandalous lack of resources) to continue to promote the investigation of these phenomena in relation to the distribution of territory, knowing a priori the characteristics of the land where we humans decided to establish our habitat, residence, work activities, etc. Urbanism and seismic microzoning have gone so far in Spain on opposite paths or, at best, parallel ones, that they almost never touch, and it has brought us, and, it is sad to say, will bring, injuries, fatalities, misfortune and suffering as it has to those still living in Lorca. Resilience through culture is avocated in this blog as one of the most effective tools to overcome adversity after natural disasters or even those disasters created by us. Architects and planners still have much to offer and contribute to this "ground", although many are not aware of the huge field of professional activities that earth sciences will provide architecture in its growth, especially in this new century, and especially with the emerging interest (and need) to look back to our heritage and its new physical contexts and uses, both of them have changed. Of all the comments I have received, I want to highlight those of Manuel Fortea, architect and doctor of art history, plus, great expert, connoisseur, and keeper of our heritage treasures, so often forgotten and abandoned. With permission granted, I step to translate this article in its deeply pedagogical comments and thoughts, words that are the vehicle of a culture, sensitivity and wisdom especially needed in our society, especially in these times so lacking in brilliance and full of pride and speculation. It is an honor for me that it may appear on this blog, as a master class that gives us an invaluable gift for its high technical value, but mostly its human one. The first sentence that I tell my students at the Ecole Polytechnique of Extremadura (formerly Technical Architecture, Building Engineering today, and tomorrow we do not know) in Construction class is: "Do not forget that Nature is working permanently (24 hours per day, 365 days a year) to destroy what man builds to return everything to its previous natural state. Sometimes it's a low-level job as rain or frost or other times an action as virulent as lightning or earthquakes. Indeed the memory of man retains these issues beyond one generation. We still believe that the walls of Jericho collapsed by the sound of trumpets, denying that the noise came from the womb of mortal soil accompanied by a jolt. Our current building technology (reinforced concrete) is barely a century old. A life too short to evaluate the final balance in his enduring struggle against Nature. Personally I think attempts of prevention of the effects of natural phenomena on the human population come closer to respecting Nature, than those of legislation "against it". When a man's ignorance is compounded by arrogance, failure is guaranteed. The best way to prevent the destruction of a flood is to not build on the riverbed. The best way to minimize the catastrophic effects of an earthquake is to not build at critical points, at points where nature dissipates its internal energy. No cook would think of putting a finger over the rising steam from the pressure cooker. Most importantly, the cook would the location of those valves. Information that applies to any culture and any historical time. Again, the best prevention against seismic effects is a detailed geographical map subsurface of geological features, an x-ray of the soul of the earth. Any attempt to believe in power to conquer nature in these battles is simply an act of ignorance and arrogance. In order to design a building able to withstand the impact of an earthquake in a scientific way, baseline data are necessary: Exact location application, released energy, duration, frequency of vibration, movement distance, number of replicates, etc. In short, unobtainable data. Can you imagine an engineer designing a structure that had to withstand lightning and voltage whose maximum temperature could not to exceed unknown values? Simply stupid. Just after the earthquake of Lisbon in 1755 the Marquis of Pombal (Portugal Head of government) was asked by his advisors "Mr. Marquis now what do we do?” Undaunted and secure he replied: "Bury the dead and take care of the living." An appropriate and timely article, it demands repetition, slowly, to all those responsible. The replicas, an average of one every hour, numbering in the hundreds, in the north of Italy, some of them over magnitude 5. Sadly, yesterday the body of the 23rd confirmed victim was found, trapped in the rubble of the recent earthquake. Six died on the 20th, and seventeen on the 29th. Aftershocks occurred at an average rate of one per hour, numbering into the hundreds, some over magnitude 5. The Italian earthquake resistant construction standard of 2004 did not yet take into account the seismo-genetic character of these dormant-faults for 450 years. The seismic memory of the people of Emilia Romagna has suffered four centuries’ worth of amnesia and tremendous human losses, as well as social, economic and cultural ones. Ferrara (World Heritage Site) the first modern city in Europe, designed urbanistically already in the fourteenth century, was made taking into account such a well known phenomenon. 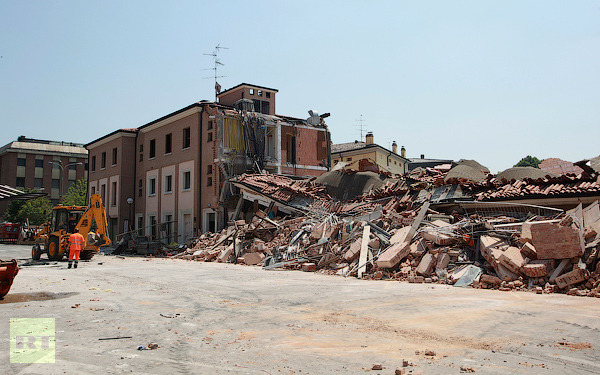 The more we know about these new Italian earthquakes in their scientific aspects, the more they resemble those of Lorca in 2011, and less those of l'Aquila 2009. Active Faults are implicit in our Spanish Seismic Code (NCSE02). Those that are not considered active are not present. The first type of faults affect a total of 2618 sites located in areas at risk from earthquakes, 724 of those sites assemble more than 5000 inhabitants, a population of over 20 million people. Of the second kind of faults we know almost nothing. However, despite Spain being a seismic country, there is no historical consciousness even in scientific circles or in the bulding sector. It has been almost 130 years since the catastrophic earthquake of 1884, called the "Andalusia earthquake", caused about 1200 deaths and destruction that came to Grade X. This long span of time has contributed to ​​our Spanish Seismic Amnesia. During this time we have tripled as a population; we have gone from about 16 million people living mainly in a rural setting, to 47 million predominantly urban and with high mobility. Therein lies the greatest danger, and much more now than before. The best weapons to successfully overcome earthquakes, we have them, but hidden away, the Advanced Land Law of 2008 is tucked into the drawers of regional autonomies, but almost nobody knows of it, this is our amnesia. The general public would not know how to react to facing an earthquake; worse, they don't know the most seismic areas of the country itself: the most crowded. 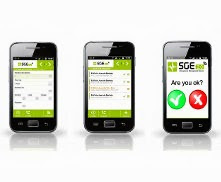 Moreover the population that is the most specialized, or even cultivated in seismic topics, is believed to be the engineers and managers those responsible for disaster mitigation through implementation and enforcement of standards and codes that are increasingly sophisticated. Engineers also believe that they are designated to lead us toward that end by applying theoretical postulates that nature always exceeded, the object of their studies: buildings and structures, i.e. the parts of the system. But the real earthquake scenario is the twenty-first century city. Earthquake resistant building standards have not been, are not and never will be enough. Spanish cities are designed with zoning laws inspired throughout the twentieth century (including any individual interest or speculative) criteria least earthquake-resistant design. The reality is that the history of Spain (excluding the 130-year period immediately preceding modernity) in the last seven centuries is replete with examples of destructive earthquakes with intensities above VIII on the Mercalli scale (above 5-6 on the Richter scale). "Earth tremors" and what to do if they occur, were subjects of study in schools and universities until a hundred years ago. The culture of the seismicity is a phenomenon that has not been updated as other aspects of the country have been, simply forgotten. The seismic amnesia of the population, media, and leaders, seems to predominate over the sporadic outbreaks of interest when something like Lorca or Ferrara arouses curiosity and makes us think of the country and its earthquakes. In these times the bars are filled with expert geologists, architects and engineers. Then time passes and the country sleeps again.